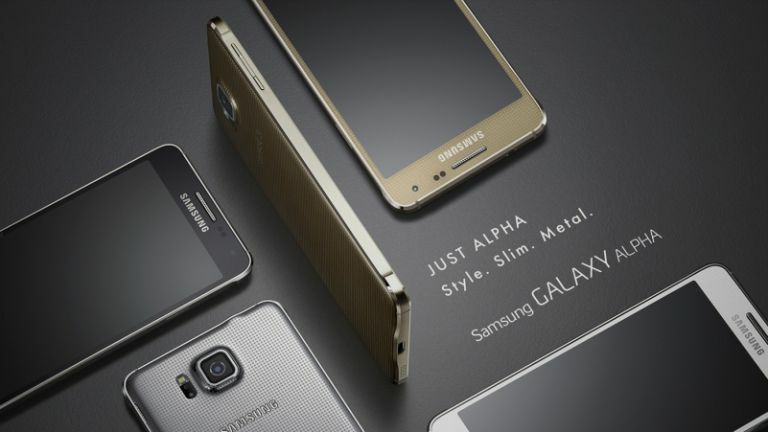 Samsung has finally taken the wraps off its long-leaked Galaxy Alpha smartphone, revealing a premium looking high-end device poised for a face off with Apple's fast-approaching iPhone 6. Sammy's new Galaxy certainly looks more stylish than the firm's previous plasticky blowers, sporting a svelte sub-7mm chassis encased in a metal frame. It still sports the dimpled soft-back rear we've seen on preceding Galaxy handsets, but it's definitely snagged that ritzy feel courtesy of its metallic trimmings. “Built with the consumer in mind, the Galaxy Alpha focuses on both beauty and functionality,” says Rob Orr, VP of Samsung UK's mobile division. On to the meaty stuff, then. The Alpha's touting a 4.7-in Super AMOLED display with a 1280 x 720 resolution, and runs off either a quad-core 2.5GHz CPU, or an octa-core processing unit made up of two quad-core chips clocking in at 1.8GHz and 1.3GHz respectively. It's set to pack 2GB of RAM as standard, as well as 32GB of internal storage, although microSD has been given a miss so you're stuck in terms of upping capacity. Juice will be provided by an 1,860mAh li-ion battery, and the device is set to weigh in at a feathery 114g. The Galaxy Alpha supports category 6 LTE meaning its capable of 300Mbps 4G download speeds, assuming your network provider is so generous. Snapping potentials on point too with a 12MP rear-facing camera and a 2.1MP front shooter to boot. There's also some bonus photo features like panorama, real-time HDR, selective focus, and virtual tour. The Alpha's also got some extra goodies too, namely Samsung's widely lauded Ultra Power Saving Mode, as well as downlooad booster, quick connect, and private mode. There's also the usual raft of sensors including an accelerometer, gyro sensor, geomagnetic sensor, light sensor, fingerprint sensor, and heart-rate tracker. Sammy says its new cellular is set to ship at the start of September, and will be available in Charcoal Black, Dazzling White, Frosted Gold, Sleek Silver, and Scuba Blue. We're not 100% on a price point just yet but we'd guess somewhere around the £500-600 mark to put it in line with the iPhone 6's expected R.R.P.